Innocently, most of us accept our destiny. We assume our life experiences are the result of mere chance. Few of us discover that our fate is actually an orchestrated tapestry woven from beyond our world. When that influencing weaver is from the netherworld, you may likely find yourself on a dark, terrifying, and tragic journey. What if you discovered a letter penned by a desperate soul from beyond the grave, a literal letter from hell? What if that letter could alter your perception of reality by revealing that you are not in control? Would you dare read it? Suddenly, out of the deafening silence, there erupted a bloodcurdling shriek from the quiet house which Mike had just walked away from, confident that all was well. Mike’s experience and training instantly took over. Instinctively, he drew his weapon and took cover behind the trunk of a large oak tree in Beatrice’s front yard. Taking a quick inventory of himself first, he then looked and saw Steve, who had almost made it to his car, standing in the middle of the road. He appeared to be paralyzed with uncertainty. Steve snapped to and reacted to Mike’s commands. He ran to his trunk and retrieved his AR-15 rifle. He then took cover behind his patrol car. From the report, Mike could tell it had been a large caliber weapon that he’d heard, probably a shotgun or rifle. All units reported en route. Mike could now collect his thoughts. He rapidly assessed. Am I okay? Check. Is Steve okay? Check. Is Mrs. Johansen okay? Check. Help coming? Check. In the distance, Mike could hear the sounds of sirens. The cavalry is coming! In what seemed like an eternity, but in reality was only a span of a few seconds, Mike had run his checklist and was satisfied he was ready to continue. His thoughts were suddenly interrupted by the sound of the same female voice piercing the silence. A first time author, M. Lee Mendelson and his wife Yvonne have six children between them, three boys and three girls. Yes–the Brady Bunch. He was inspired and encouraged by Yvonne to write his first book after he proposed the concept to her. 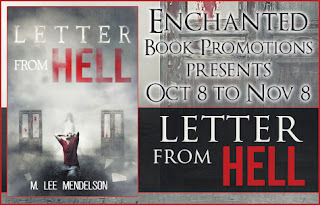 M. Lee never dreamt of writing anything before his first book, but has now discovered he has a passion for writing, with one idea after another pouring out of him. A rare native Floridian, M. Lee recently retired from a career as a full-time firefighter and part-time law enforcement officer. His twenty-six years of experience on the streets have given him a vast array of experiences; some good, some bad. His recent retirement allows him much more freedom to dedicate to his newfound obsession with the written word. 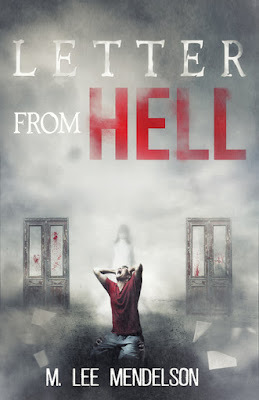 His first book, “Letter From Hell,” is a complex horror novel with a little something for everyone M. Lee’s real-life experiences, coupled with an active and vivid imagination, allow his stories to come alive. Striving to paint pictures with words, he immerses the reader into his scenes. His ambition is that people will enjoy reading his work and deem it worthy to recommend to others.